This solitaire uses 52 cards. 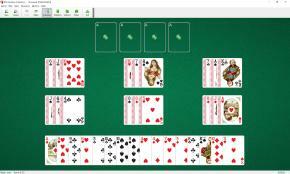 This is one of the best single-deck solitaire games. You have four foundations and 6 fans with 6 cards in each. You also have 16 open cards below the fans - the reserve. Only the top card of each fan is available for play on foundations. You may build fans down in sequence and alternating color. One card or group of cards in the proper sequence can be moved from one fan to another fan. Spaces in the fans may be filled by any card or group of cards. All cards in the reserve are available for play on the foundations or fans.